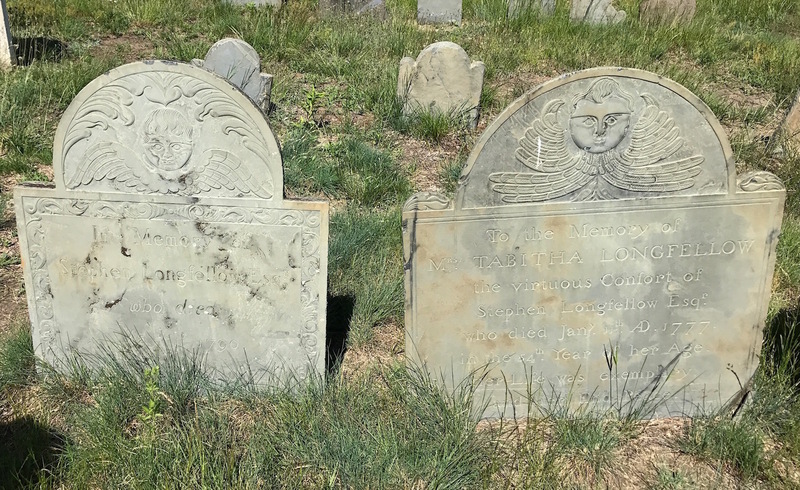 Having spent the last two weeks focusing mostly on stone cutter Bartlett Adams, I’ll wrap up my series on Eastern Cemetery by looking at some of the other markers and their different styles. Mary Green’s head and foot stone mark the oldest known burial at Eastern Cemetery of May 23, 1717. 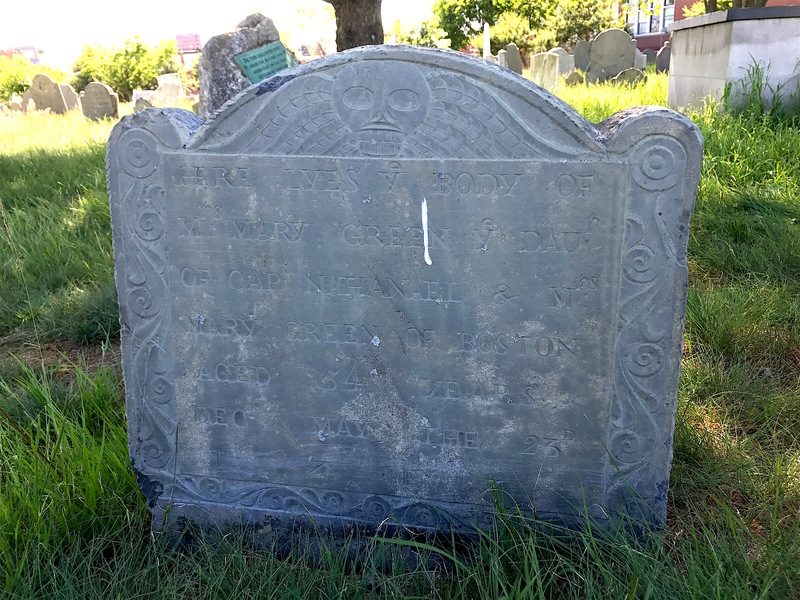 The inscription says, “Daughter of Cap Nathaniel and Mrs. Mary Green of Boston Aged 54 years.” Records indicate she was born on May 3, 1663 and never married. Mary Green’s early 18th-century slate marker features the winged skull, a popular theme at the time. 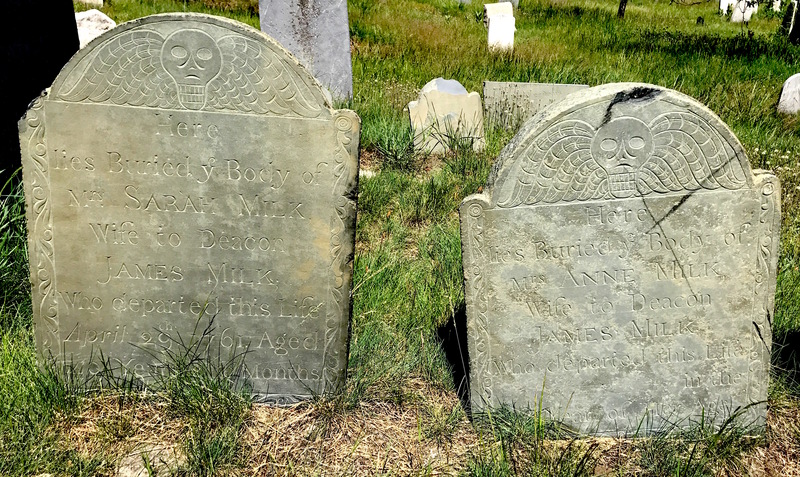 I’ve featured pictures of winged skull markers that I’ve taken in Charleston, but it’s worth revisiting the subject since this was the style those stone cutters were trying to emulate. Why such a gruesome symbol? It all has to do with the time period in which they were made. Most were made in the 17th century and into the 18th at the behest of the Puritans that lived in New England. The Puritans did not like putting religious symbols on grave markers, such as crosses, angels or Christ figures. You never saw them in their meetinghouses either. They were very much against attributing human form to spiritual beings. So why the winged skull? Considering the average lifespan at this time could be quite brief, being conscious of life’s fragile nature was paramount. The Puritans thought you needed to make the most of your time on earth to ensure where you wound up after you died. This carried over into reminding the loved ones that you left behind when they came to visit your grave. That winged skull would remind them that living a good life would result in ending up in Heaven after they died or in agony in hell if they didn’t. Sarah Brown Milk and Anne Dunn Deering Milk’s markers are another example of the winged skull motif. They were both the wife of James Milk. James Milk was husband to first Sarah Brown Milk and later Anne Dunn Deering Milk. Anne (then Dunn) first married John Deering, a ship master. Like his father, Deering commanded the vessels of his cousin, Sir William Pepperell. 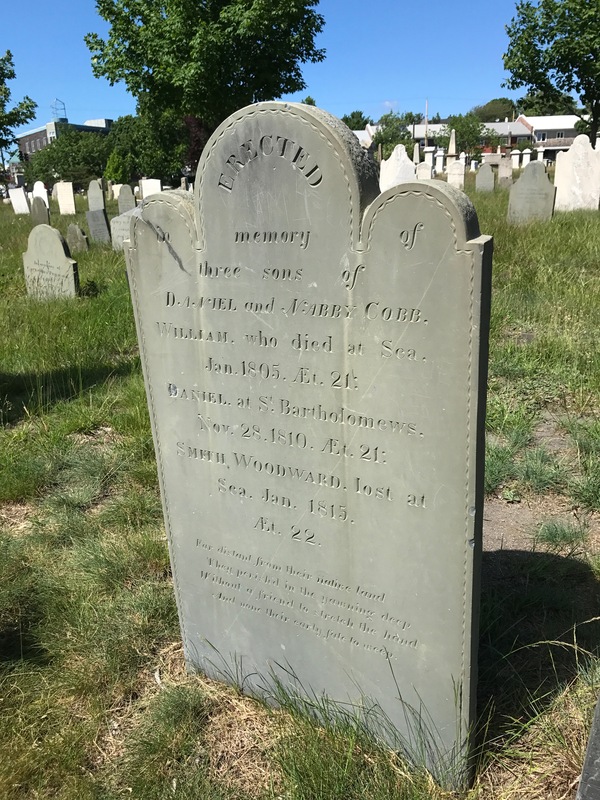 Deering died at sea in 1758. They had two sons who lived to adulthood. A native of Boston, James Milk is called “Deacon James Milk” on his marker. He married Sarah Brown before 1738. She died in 1761 after they had at least three children. He then married the widow Anne Deering, who died in 1769. James died a few years later in 1772. Sometimes just a skull and bones (sans wings) were enough. When I posted the picture of gravemarkers of two children on the blog’s Facebook page, I got some shocked reactions. It’s even more dramatic in person. 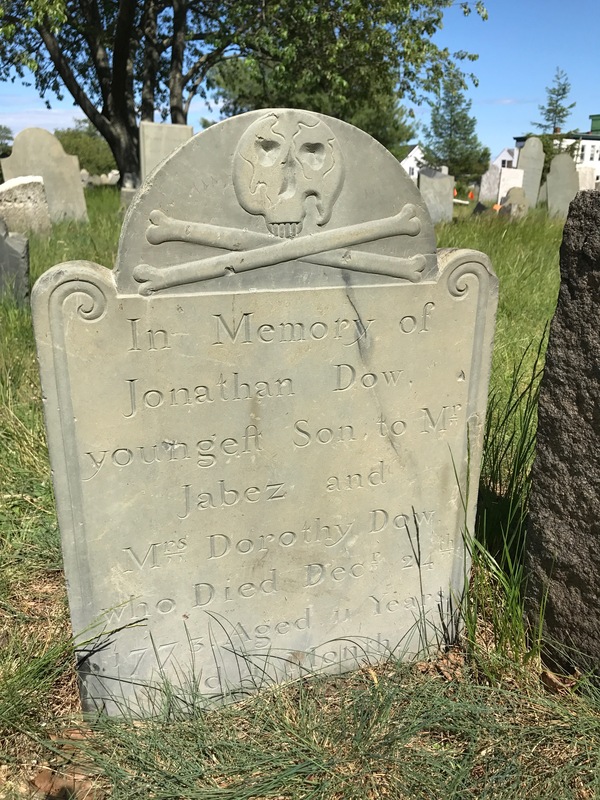 Jonathan Dow died at the age of 11. Why put a skull and crossbones (more associated with pirates) on a child’s grave? I can only surmise that this was a favorite motif of the stone cutter doing the markers in Portland at this time. Bartlett Adams didn’t arrive until 1800 and he didn’t usually do carvings like this. I’ve read that Spanish cemeteries once had the skull and crossbones at the entrance to indicate it was a place of death. Others have mentioned the Knights Templar but that doesn’t fit in this case, in my opinion. Perhaps it’s reflective of the illness that visited the Dow family since the two children died so close together. In the case of Jonathan Dow, the motif is a skull with teeth biting into crossed bones. 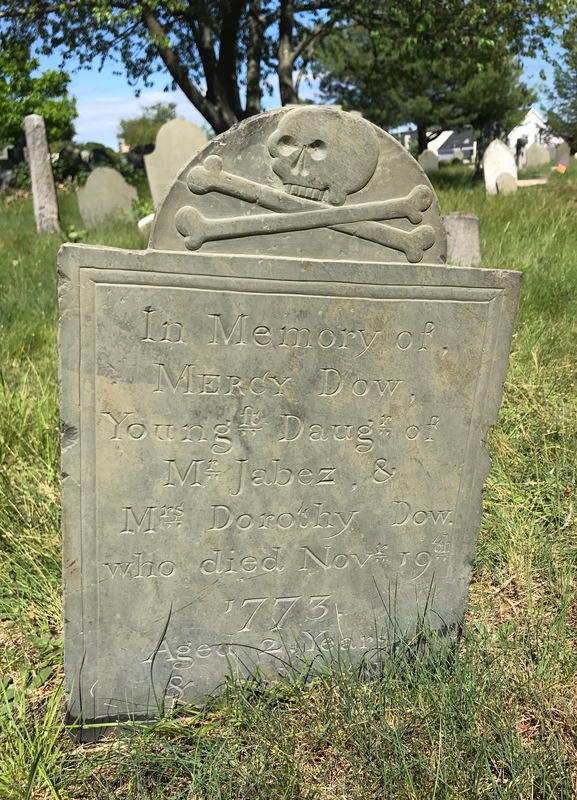 He died at the age of 11 on Christmas eve of 1773, the youngest son of Jabez and Dorothy Woods Dow. It’s probable that the same illness that killed Mercy also took the life of her brother Jonathan a month later. Sadly, Jonathan’s younger sister, Mercy, died about a month earlier at the age of two. Her marker also featured the skull and bones. She is listed as the youngest daughter of Jabez and Dorothy. The winged skull eventually gave way to the winged cherub or “soul effigy”, which sometimes involved the face of the deceased with wings on either side. This indicates the movement toward more acceptance of using a human likeness on a gravestone, although the winged skull remained popular. Bartlett Adams was fond of carving these winged cherubs. Stephen and Tabitha are thought to have lived their entire lives in Gorham, Maine, about 15 miles west of Portland. Stephen was quite active in local government as town clerk, clerk of the Proprietors of Common Lands, clerk of the Judicial Court, and Register of Probate for Cumberland County. Stephen Longfellow (on the right) died 13 years after his wife, Tabitha. Their grandson, Stephen, was elected to represent Maine as At-Large in the U.S. State House of Representatives from 1823 to 1825. He also served as a member of the Massachusetts State Legislature in 1814, and a member of the Maine State House of Representatives in 1826. 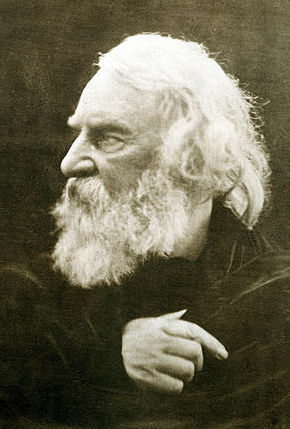 Stephen’s second son was Henry Wadsworth Longfellow, who was born in Portland in 1807. Sometimes there was no decoration at all on markers. This stone for three sons (William, Daniel and Smith) of Daniel and Nabby tells a story that needed no further illustration. They died between 1805 and 1815, five years apart. All of them were in their early 20s and appeared to have died at sea. Three of the Cobb sons perished at sea, five years apart. And none their early fate to weep. 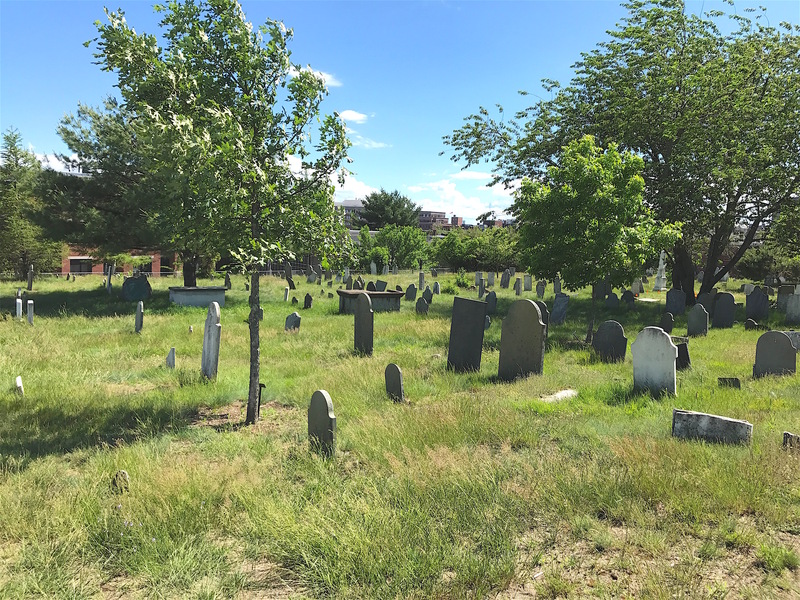 I could find out nothing about the circumstances surrounding their deaths, but it’s likely that only William’s body is buried at Eastern Cemetery. If Daniel died “at St. Bartholomew’s” and Smith was “lost at sea”, their bodies were probably never recovered. Such events were quite common in seaside towns like Portland. I cannot end my visit to Eastern Cemetery without mentioning a brand new marker that sits near the back wall. It belongs to William “Billy” Brown, whose story is quite different than most of the people buried there. 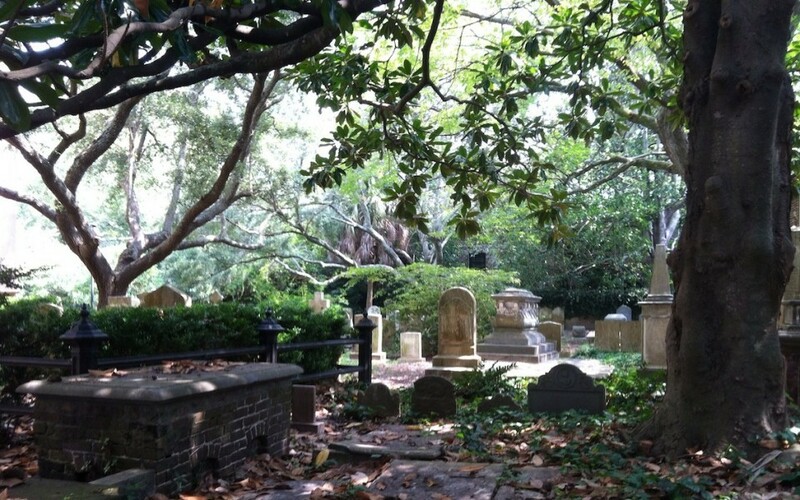 A small portion of Eastern Cemetery was used for slave burials, and most are unmarked. 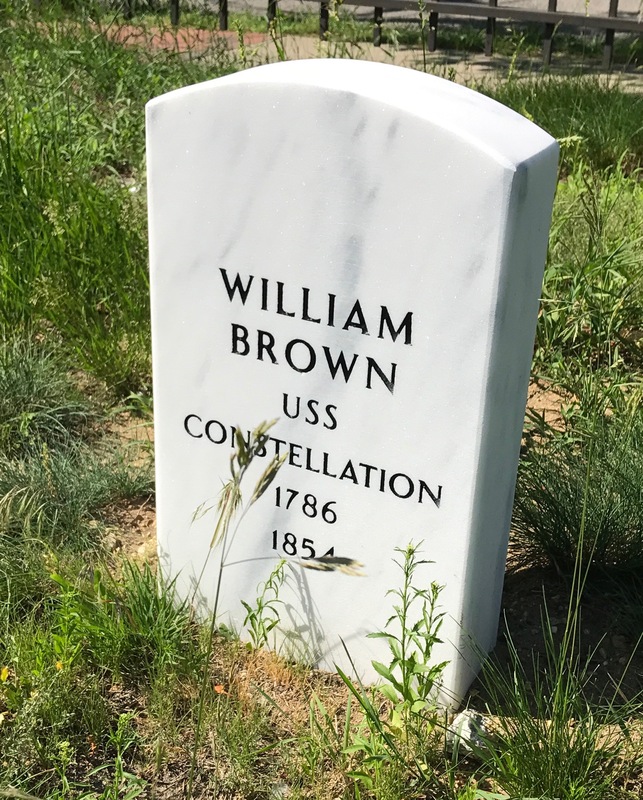 Only in February 2017 was the stone for Billy Brown created and installed, and it took much effort to make that happen. In 2013, local historians Larry Glatz and Herb Adams found out about Billy and worked to make things right. The full story can be found in this Bangor Daily News article. A “powder boy” injured in the line of duty, Billy Brown didn’t receive his much-deserved pension until after he died. Thought to have been born in Baltimore in 1786, Billy joined the Navy in childhood. Such a thing was not unusual at the time. Billy may have started life as a slave, but that’s not certain. He held the job of “powder boy” on the U.S.S. Constellation during the little-known “Quasi War” with France from 1798-1800. Powder boys hefted buckets of gunpowder from the magazine to the cannons, deadly work for a child. Billy was injured when a musket ball hit his left foot near the ankle joint, which never healed properly. 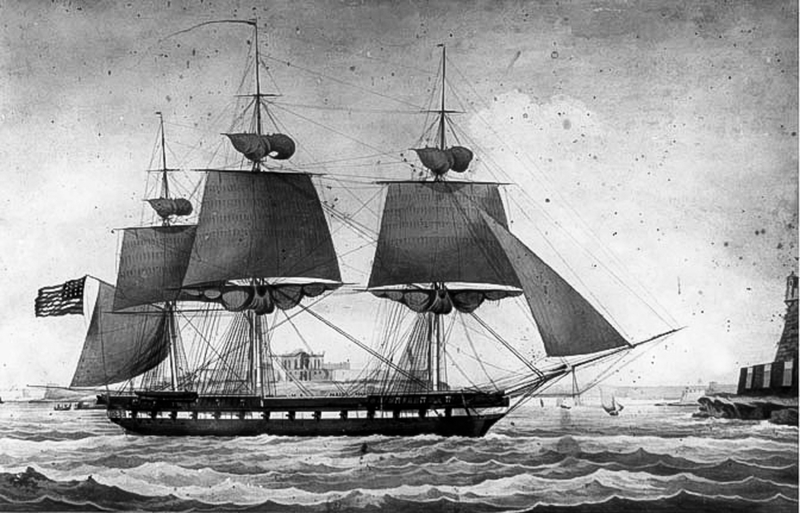 Billy served for about another 15 months and survived at least one other battle with the French in February 1800 when more than a dozen of his shipmates died. Billy married Matilda C. March in Portland on May 31, 1829. They lived near the Abyssinian Meetinghouse, considered the center of African-American life in Portland. Billy worked for some years as a sea cook and when ashore, he drove cargo around town in a wagon. But his old injury made it hard to work and he sometimes had to ask for help from friends to get by. Between 1844 and 1854, Brown petitioned the government five times for a pension. He enlisted the help of pension agent Freeman Bradford. In those days, no federal Department of Veterans Affairs existed so each veteran’s pension was handed out by separate acts of Congress. 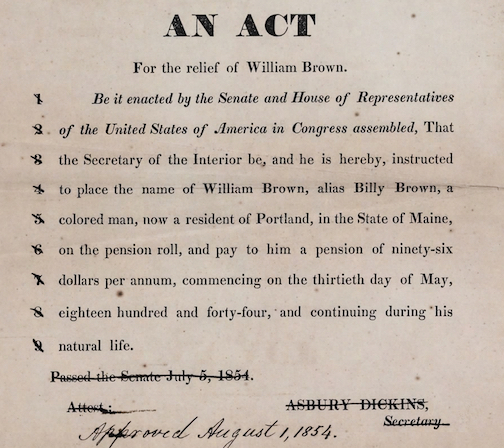 Finally, on Aug. 1, 1854, Congress passed An Act for the Relief of William Brown. The act gave Billy $96 a year, retroactive to when he’d first applied a decade earlier. Sadly, he had died in May of that year and was buried in a pauper’s grave in Eastern Cemetery. But his wife and their family were able to benefit from his pension. When Glatz and Adams took up the cause to get Billy a proper marker, they faced as many roadblocks as Billy had when he sought his pension. But thanks to their perseverance, Billy’s grave is now properly marked (although the conflict in which he fought was left off by the government engraver) and people can stop to honor him when they visit Eastern Cemetery. There are many stories still left to share from Eastern but that would take up more space and time than this blog allows. I hated having to say goodbye to head to our hotel before we attended a Portland Seadogs game that evening, but I knew I’d been blessed to even have an hour there to see and learn what I did.